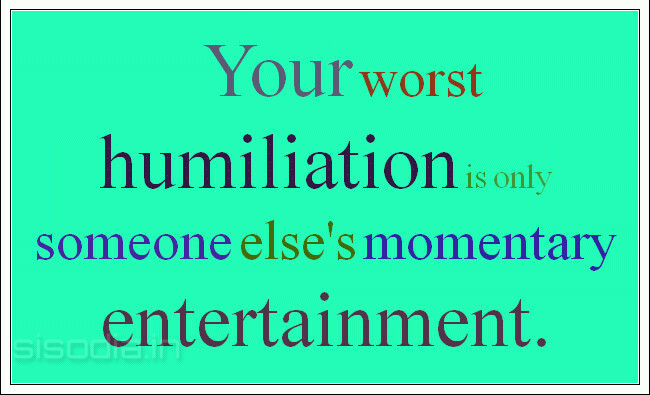 If someone has made you feel stupid, very embarrassed, or ashamed then you have been humiliated. The humiliation frequently does not last very long unless you have been humiliated in public and many humans will remember your humiliation and your reputation may suffer. If you have behaved stupidly or badly but not in front of someone then humiliation is not an issue. The only time that we feel humiliation is if we know that our stupid or bad behavior has been witnessed by someone who disapproves and frequently tells us how stupid or bad they think it really was. Parents sometimes humiliate us so that we feel bad enough so that we will not repeat the stupid or bad behavior again. This entry was posted in common sense, education, parenting, science, society and tagged common sense, education, humiliation, language, parenting, pride, science, selfworth, shame, society, the truth about humiliation, words on October 11, 2014 by uldissprogis.